We are working on putting various parts of our curricula into a format usable by home schooling parents and other teachers. Payment can be made through Paypal, VISA, Mastercard, Discover, or American Express. If you have any difficulty ordering or have questions about the items, please call us at 707-545-0861 (our home phone number) or e-mail us at jkhughes@stmichaelschool.us. On rare occasions, orders for Sanctity Through the Centuries have been placed in the spam folder, Please check your spam folder if your order has not arrived in a day or two. A Note About Shipping Costs: Our intention is to keep shipping charges as close to actual costs as possible. We have had to slightly increase our rates because of the recent increase in postal shipping rates. Our rate schedule is as follows. We recently had to increase our rates as a result of the USPS increase their rates. The shopping cart can only approximate the actual cost, since distance, materials purchased and the weight of the materials affect postage. This is especially true of the math manipulatives which weigh 2 lbs. and 4 lbs. Fortunately we can fit one of each of the manipulatives into the Post Office’s Flat Rate Boxes. The items in our bookstore fall into four categories - books, math manipulatives, art supplies and educational card games. These pictures give an overview of what we have available. Details are given further down the page. 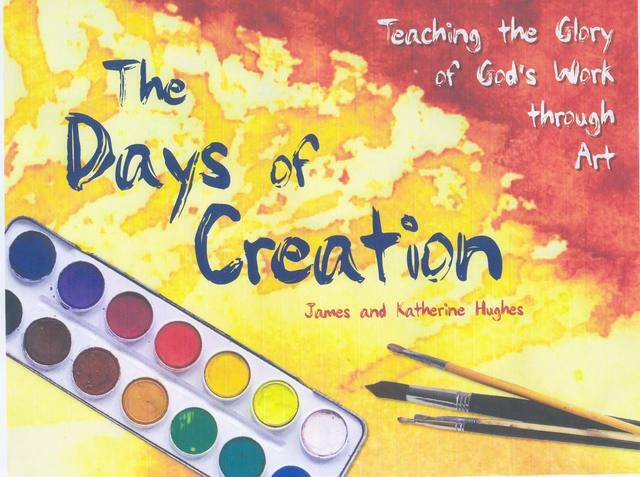 The Days of Creation art book provides a way for children (ages 9 and up) to learn about the days of creation through painting representations of each of the days and making their own book about God's glorious work. The book includes twelve (12) lovely watercolor paintings, depicting God's work during the six days of creation, as well as detailed instructions for reproducing each painting. Even novice painters have produced some very acceptable paintings using this book. Still not sure about trying watercolor painting? Our students have also used crayons and chalk to produce the same images. The medium your children use is less important than the activity of producing an piece of art to the best of their ability. 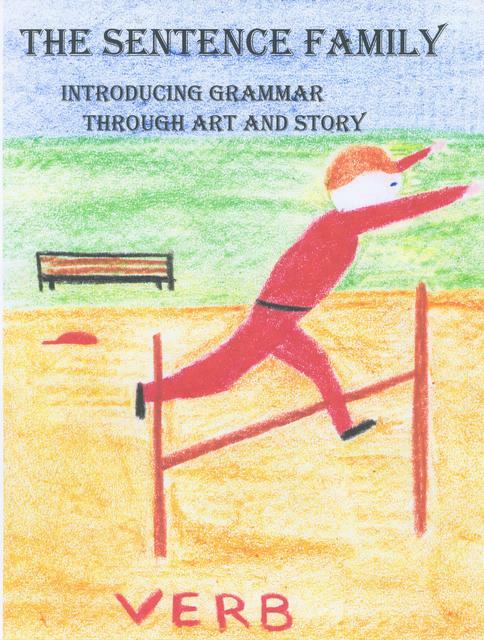 Whatever the medium, your children will treasure the book they produce for many years. Besides the painting instructions, the book provides religious instruction by including, for each day, commentaries from the early Church Fathers, thus revealing the traditional Orthodox teaching concerning the Genesis text. The book is spiral bound, 8 1/2" x 11", 50 pages. For pictures of some of the paintings, click here. Please Note: We are no longer able to stock The Days of Creation Art Book since other sources can sell it much less expensively. We suggest that you purchase the book through Christian Book Distributors, Christianbook.com. In a recent catalog, they sold the book for $9.99. This curriculum was developed many years ago with the inspiration of a fourth grade class. What started as a class on the four kinds of sentences, blossomed into an engaging approach to the parts of speech and basic diagraming. Former students, now in high school, say that they still think in terms of The Sentence Family. For some testimonials and sample pages, click here. More testimonials can be found if you search for "The Sentence Family" through Goggle. Many home-school bloggers are talking very favorably about the book. Only one book is needed for the whole family. Good News! The Sentence Family is now available in two forms. You may purchase a bound, printed copy in The School Store or purchase it as a PDF download at CurrClick.com. The PDF version is $12.00. Go to www.currclick.com/index/php?cPath=1467. A Closer Look is our newest book. It was written as a response to many Orthodox Christian parents who were unsure of how to present the idea of "evolution" in their science classes. We have all grown up in a culture that is saturated with an evolutionary perspective. We are constantly told that the theory of evolution is actually a proven scientific fact and that to question the idea of evolution is to question science. Even some Orthodox authors have written that there are really no contradictions between an evolutionary perspective and the teachings of the Church. Although this book presents some Scriptural and Patristic challenges to evolutionary theory, its main objective is to begin to show that the idea has serious scientific failings. It also demonstrates that what is presented in most textbooks and other media as "proof" of the theory, has no real substance when examined more closely. Believing in evolution is actually not "science-friendly." Those who believe that God used an evolutionary process will be surprised 1) at the gradual decline of faith in the life of Charles Darwin, that 2) there are two definitions of "evolution" - one true and the other false, and that 3) much of what we were taught in our biology classes concerning evolution is simply untrue. The author was educated, and initially believed, in an evolutionary perspective. He has taught biology and other sciences for over thirty years and has studied evolutionary theory for the last twenty years. A Closer Look is not a long book, but it is accurate and informative. It was written for those who want to be informed, but do not have the time or the inclination to read the much longer books that are available. The book is 8.5 x x11, spiral bound and 55 pages long. Since many home-schooling families are struggling to find answers concerning the creartion/evolution debate, we are now offering the PDF version at no charge. Simply click for a PDF file of the book. There are actually two files, one is the book, the other is the cover. To see the Tables of Contents and read the Introduction, simply click here. Sanctity through the Centuries is a chronological listing of saints of the Eastern Orthodox Church. The saints are listed, divided into centuries, in order of the year of their death. The saints' feast dates, general geographical information and sources for their lives are also included. The listing is based on the calendar published by St. Herman of Alaska Press, with much additional material from other Orthodox sources. All "western" saints listed are those before the Great Schism in 1054 A.D. 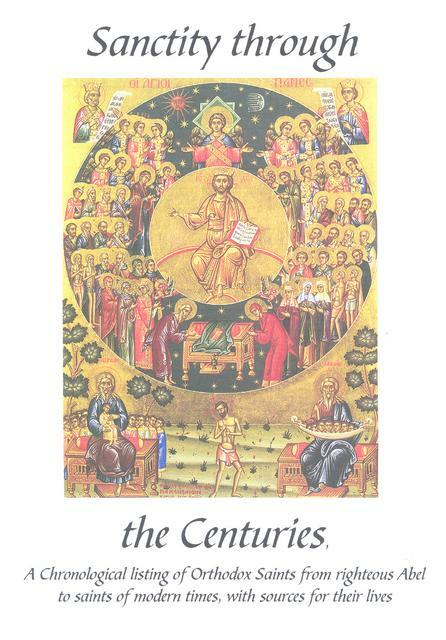 The inspiration and goal for these books is to provide a way for Orthodox teachers to integrate the lives of the saints with the study of church and secular history. The books are priced very low because we know that a "shipping charge" will automatically be added by the shopping cart. You may, of course, purchase each volume separately, but given the way the shopping cart works, it is best to purchase the three volumes at the same time for $16.25. In this way you are paying only one "shipping charge". These books are not printed, but will be sent in PDF format to the e-mail address provided during purchase. If purchased alone, the total for this volume is $8.35, including the shipping charge automatically generated by the Paypal shopping cart. If purchased alone, the total for this volume is $8.60, including the shipping charge automatically generated by the Paypal shopping cart. If purchased alone, this total for this volume is $7.85, including the shipping charge automatically generated by the Paypal shopping cart. These are the paints we use for our Days of Creation book and all other paintings. We have used these concentrates for over twenty years and have found nothing better. The paints are brilliant and completely non-toxic. We actually water our plants with the water used for rinsing the brushes. 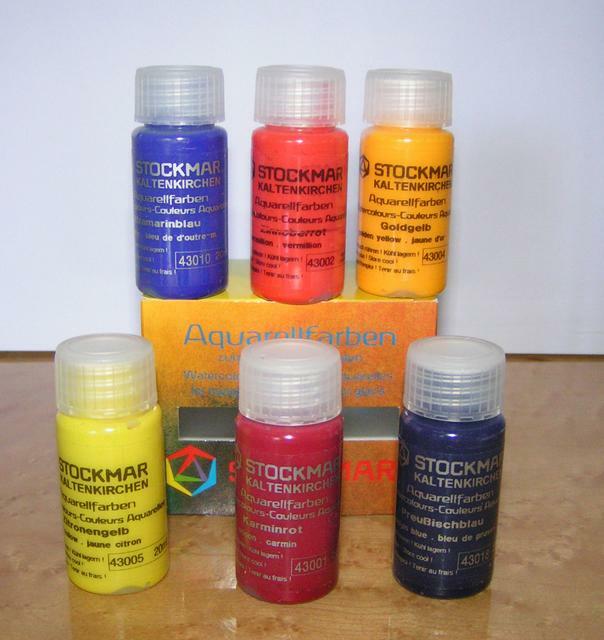 The set includes six - 20 ml plastic jars of concentrate - carmine red, vermillion (orange), lemon yellow, gold, Prussian blue, and ultramarine blue. These concentrates make enough paint for scores of paintings. Please note : We are currently out of stock for this item and do not know when we will be able to obtain more. You may want to check availability at other websites. A good brush is an important tool for painting, but most families, or schools, will not want to spent a lot of money on a brush. We have tried several brushes and have found an inexpensive one that works well. This brush closely resembles the one we use for watercolor painting in school. When teaching children the principles and facts of arithmetic, it is very important to be as concrete as possible. Many children have trouble with arithmetic simply because the emphasis is placed on the mechanics and worksheets and not on the physical manipulation of objects. Mathematics is a language, in a very similar way that English is a language. Math is a language which describes the relationships of physical objects, just as English is a language which describes ideas. Therefore, to understand mathematics, a child needs to handle physical objects not just memorize ideas, or rules. Worksheets are fine for practice, but they are useless for giving understanding. You can read more of our approach to math in the article "Teaching Math in the Early Grades". The following two items in our store are sets of manipulatives we use extensively with our students. We are starting to get feedback from other teachers who have used the manipulatives. Click here for a sample. Since we make them ourselves, sometimes we are out of stock for a while. If you would like to order an item that is noted as being "out of stock" please let us know (store@stmichaelschool.us) and we will do what we can to make additional sets as soon as possible. The common multiplication tables make beautiful patterns on this specially designed string board. Making the board is a very enjoyable and easy math/woodworking project. We are offering a kit which includes 1) an 7.25 inch square piece of pine, 2) a piece of 100 grit sandpaper, 3) a circle used to mark the ten - 36 degree sections, 4) a dozen finish nails, 5) a 6 ft. piece of colored yarn, and 6) complete instructions for assembly. This kit provides a simple craft to integrate with a child's arithmetic lessons and shows one of the hidden beauties of God's creation. You can read what one home-schooling Mom had to say here. The instructions may be seen in the Curriculum Ideas section under The Patterns of the Times Tables. We have the students make a simple book which shows each times table and the accompanying pattern. A sample of the pages for the four times table is here, and a free download of forms for the book is here. From the very beginning of formally teaching arithmetic, we make the lessons very concrete and multi-sensory. This set of wooden manipulatives are called “The Number Family” manipulatives, because we use them to introduce “number families” to the children. 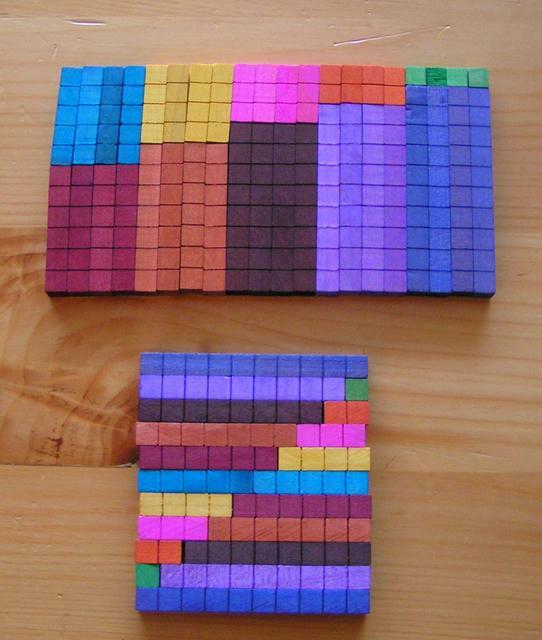 Each of the numbers from 1 through 10 is represented by specially dyed hardwood blocks of appropriate lengths. The set includes a total of 120 pieces. These manipulatives have many uses. If you have Microsoft Publisher, you may see the instruction booklet by clicking here. If you do not have Microsoft Publisher, you may go here to see the booklet as a series of pictures. We make the "Number Family" manipulatives, as well as the "Up the Hill" manipulatives ourselves, so we do not always have them in stock. These are the “Up the Hill” manipulatives, a name taken from the students’ favorite math game. They provide a concrete way to teach 1) carrying and borrowing (re-grouping), 2) the times tables, as well as 3) two-place multiplication. Each set includes 1 Thousand-Block, 10 Hundred-Flats, 35 Ten-Bars, and 50 Units. 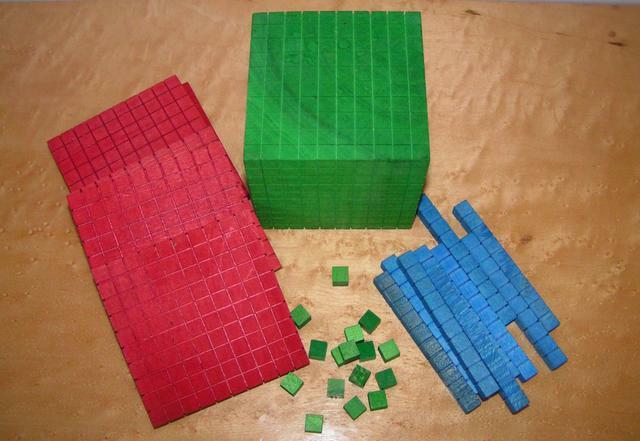 We often use them in conjunction with the “Number Family” manipulatives. If you have Microsoft Publisher you may see the complete instruction booklet here. Up the Hill Manipulatives $42.00. The next section of our store offers some math games which we have found to be very useful in developing a fluid or flexible understanding of the times tables. Once the children have learned the basic times tables in a very concrete way, i. e. with manipulatives, they still need practice in order to be fluid in this understanding. This means that they need to know multiplication forward (3 x 5 = 15), backward ( 45 = 5 x 9 ) and inside out ( the common factor of 42 and 48 is 6, or the common factors of 36 and 24 are 3, 4, 6, and 12). They will need to be fluid in these ways in order to easily work with fractions and to successfully work with various operations in algebra. Teaching children this type of detail might seem a difficult task, but it is greatly simplied with the use of particular games. You may know that the Latin word, Ludus, means both "game" and "school". This may seem to be an odd combination of meanings since, for a child, the word game usually means "fun", but the word school - well, sometimes not so much fun. Yet, we have seen great wisdom in this Latin word because children can learn a lot through games. With this in mind, we have developed a number of card games which reinforce math skills. We have taught children math for thirty years and have found these games to be very helpful as well as enjoyable. We have developed and used these games with great success at St. Michael's. Once children know the times tables in a "forward" direction, they need to know them in a "backward" direction. In other words, once they know that 3 x 5 = 15, they need to know that 15 = 3 x 5. Knowing one direction does not mean that they automatically know the opposite direction. As they continue studying mathematics, they will need to know the times tables in three directions - forward, backward, and inside out. We have developed games for each of these directions. Using the Number Family and the Up the Hill manipulatives gives children plenty of experience in the forward direction of the times tables. The Product to Factor Game (PTF) (if you have a better name, please suggest it) helps the students develop fluidity in the backward direction. The game is essentially an empty grid which the students fill in with the appropriate factors. All parts of the game are printed 8.5 x 11, glossy cardstock. When the four pieces making up the grid are taped together the result is larger square, approximately 16.5 inches by 16.5 inches. The game includes instructions, the empty grid, a sample of the completed grid, and pages of numbers which, after being cut out, the students place in the proper places. The picture on the left shows the completed grid. The game can be played at various levels. Instructions for the game can be seen here. The Latin word, Ludus, means both game and school. This may seem to be an interesting combination since, for a child, the word game usually means "fun", but the word school - well, sometimes not so much fun. Yet, we have seen great wisdom in this Latin word because children can learn a lot through games. With this in mind, we have developed a number of card games which reinforce math skills. Factor Match is a card game which gives students an enjoyable way to practice recognizing common factors in numbers. 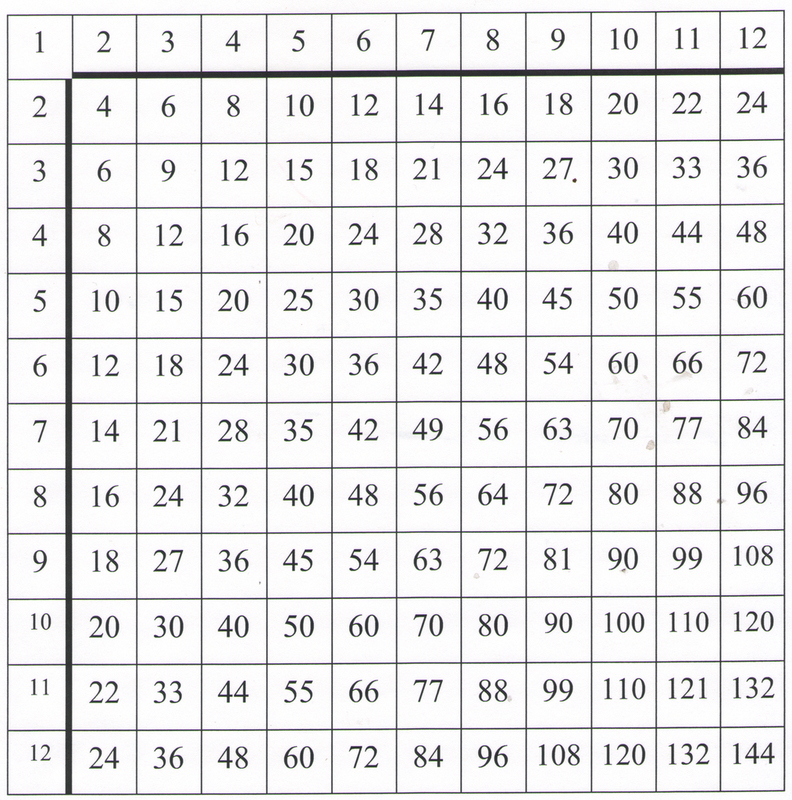 It also gives practice in recognizing the various ways a number can be reached on the times tables. These two skills are very important when working with fractions and in various operations in algebra. Click here for the complete description and rules. There are a total of 99 cards in this game. They are the standard card size and are printed, in color, nine cards on a page, on glossy cardstock. You will simply need to cut out the cards and start playing. Homophones are words that have the same sound but different meanings and different spellings. The name comes from two Greek words, homo, which means “the same” and phone, which means “sound.” The purpose of this game is to provide an enjoyable way to teach students the correct usage and spelling of 192 (96 pairs) homophones. The game Homophones can be played in a way similar to the children’s card game “Go Fish”, or it can be played as a concentration game. The rules for play can be seen here. We have prepared four sets of homophone cards, each having 48 cards, or 24 pair of homphones. Each set is printed in full color, on high quality glossy cardstock. The words in each set can be seen here. Each set of Homophones is $4.00. Buying all four sets at once for $15.00. Buying all at once also saves postage expense.